One of the main goals of every smart infusion pump is to prevent medical errors and in turn, improve patient safety within the facility. The Sigma Spectrum promotes better patient safety with its defining feature: the drug library. 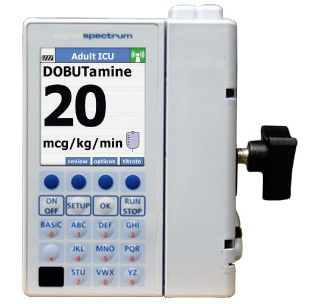 The Sigma Spectrum Infusion System’s high drug library compliance with its Dose Error Reduction Software (DERS), identifies potential harm through infusion medication programming errors prior to administration. This feature will significantly decrease any unnecessary risk for patients during an infusion. The Sigma Spectrum is also a popular choice for healthcare facilities because of its mobility and readability. The light-weight device can be transported anywhere in a facility and used in a variety of clinical settings. Nurses and clinicians enjoy working with the easy-to-read color display, digital help screens, and the simplicity in the setup before administering an infusion. The facilities that integrate a hospital’s electronic medical record (EMR) with the Sigma Spectrum save time for their nurses by cutting down the time they spend documenting. This device is an all-around smart choice for both patients and the hospital staff. Med One rents and sells Sigma Spectrum pumps with Pump Operating Software versions: v8.00, v6.05, v6.02, and v5.02. To learn how to set up a Basic Infusion with the Sigma Spectrum watch our helpful video below.